What kind of German Shepherd is she? I just purchased a German Shepherd from a Pet Store. I would like to find out what kind of shepherd is she from the color and markings. Could I send you a picture? 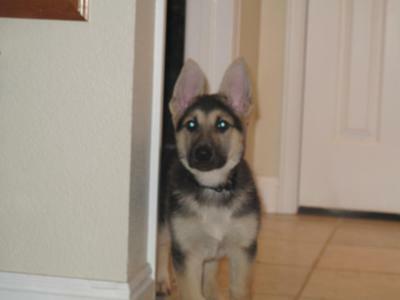 From the picture, she looks like a black and tan German Shepherd puppy to me. Can't see her back but I'd guess from her current coloration and markings that she'll either be a blanket back or a saddle back when she's fully mature - around 2 to 3 years old - keep in mind that she'll lighten up as she ages too, probably. She is a very cute GSD puppy. Good luck with her and keep the pictures coming.